At the end of ‘60s, in the same time with the re-creation of the Romanian aviation industry, three major milestones were established in the field of design of military jets – the design and production of a subsonic close-air support aircraft, which became IAR-93 -the first postwar combat aircraft built in Romania, a combat – capable jet trainer - the IAR-99, and finally a supersonic fighter. Capabilities for advanced research were created during the '70s within the former INCREST (now inherited by INCAS), and these included a Mach 3 capable wind tunnel. 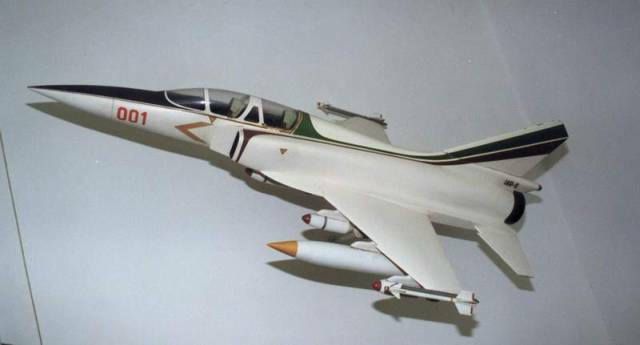 In late '70s, the initial studies for the IAR-95 supersonic fighter were started, under the leadership of Dipl.Eng. Dumitru Badea. IAR-95 was a lightweight aircraft, with a single-engine configuration. The design required an engine thrust of 54 kN dry and 91 kN with afterburner, respectively. The aircraft was a high wing monoplane with side air intakes. One of the proposed designs featured two fins. Although the structural design of IAR-95 was in a quite advanced stage, the lack of availability of a suitable powerplant led to the cancellation of the initial IAR-95 project in 1981. Wing sweep at quarter chord: 35 deg. The supersonic fighter program was restarted in early '80s under the leadership of CoI.Eng. Constantin Rosca. The first layout of the new design was named IAR-101 and had the general layout similar to the early IAR-95, but had a thicker fuselage, four hardpoints under the wings. The next step was IAR-S, several models were built and tested in the wind tunnel. Those were either with a single engine or with single fin, two engines and two fins, single and two-seater. The single engine two-seater was presented as a multirole aircraft. The model of this last IAR-S layout is still kept today in the entry hall of INCAS. The demonstrator had to be built in I.Av. Bucharest in Bãneasa (today Romaero S.A.), and a special branch of INCREST was moved to new facilities created in the neighbourhood of the factory. This time the aircraft reached the detailed design stage, but in 1988, due to financial reasons the whole programme was definitively cancelled.